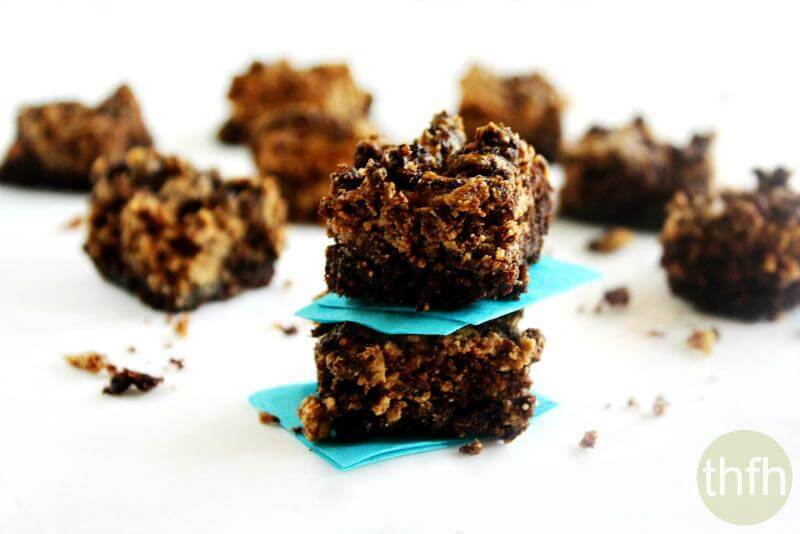 These Flourless Peanut Butter Swirl Brownies are a perfect clean eating recipe to make if you’ve never made flourless or grain-free desserts before. This is a simple recipe that is made with only one bowl and is ready in less than 30 minutes. I love to make flourless, grain-free and gluten-free desserts like these Vegan Flourless Zucchini Brownies, Flourless Chocolate Chip Pecan Cookies, or these Grain-Free Chocolate Chip Cookies. My brain just can’t comprehend how you can get a dessert that is moist and crumbly like a regular flour-filled dessert, but have absolutely no flour at all. 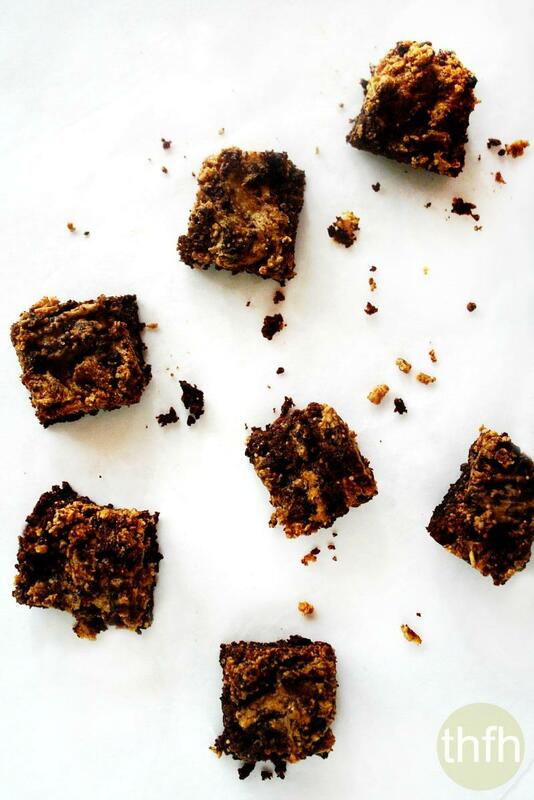 You mix everything up thinking, “there is no way this is going to come out like a brownie/cookie/etc” and while it bakes, something magical happens, because it does! Notice the very first ingredient is sugar. White, refined sugar. Followed by bleached flour and lots of GMO’s (soybean oil, cottonseed oil, corn starch, soy lecithin). This healthier version is made with clean, real food ingredients and it’s flourless, grain-free, vegan, gluten-free, dairy-free, egg-free and contains no refined sugar! Want more healthy dessert recipes? Check out Gluten-Free Vegan Pecan Pie Bars, Clean Eating Chocolate Chip and Sweet Potato Bars, Almond Power Bars with Chocolate Topping or my Clean Eating Cookbook with an entire chapter of 20 healthy, clean eating dessert recipes just like this one that you will love! Tip #1: I’ve made these several times and a couple of times I’ve reduced the maple syrup down to 1/2 cup and they did fine and another time, I used raw coconut crystals to reduce the amount of sweetener. However, they seem to hold up best with the original recipe amount of 2/3 cup of maple syrup. Tip #2: This recipe was enough to make a small batch in a 5 x 9 glass baking dish. I cut them into bite-sized pieces for myself, but if you were making them for a family or larger group, you would need to double or triple the recipe. Tip #3: This recipe can be made with homemade peanut butter using a Vitamix. For more recipes you can make with a Vitamix, visit my Vitamix Recipe Index page for more inspiration! Tip #4: You don’t want the peanut butter swirl layer on the top to be too thick. I’ve eye’d the peanut butter swirl amount before instead of measuring it out, and if you have too much, the peanut butter flavor takes over the chocolate brownie flavor too much. You just want a thin layer of swirl – more brownie than swirl. Step 1 In a medium sized bowl, mix all the ingredients for the brownie together until well combined. Spread the brownie mixture in a 5 x 9 glass bread pan. Set aside. In a small saucepan, gently melt the 1/2 cup peanut butter (for the swirl) on lowest heat. Drop 4 spoonfuls of the melted peanut butter on top of the brownie mixture in an even row across the top. 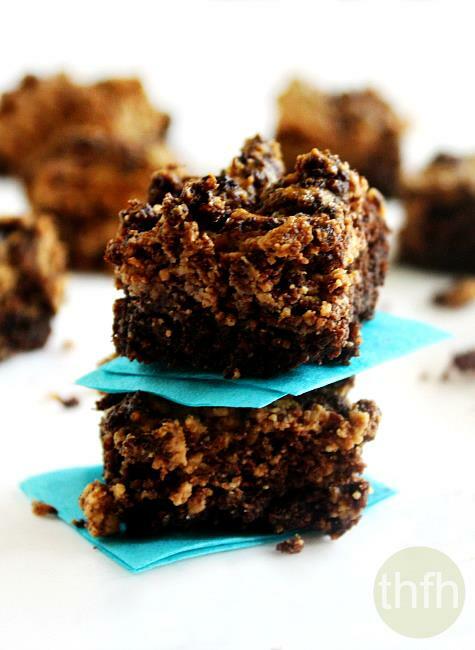 Using the tip of a sharp knife, swirl the melted peanut butter into the brownie mixture to create a marbled effect. Bake at 350 degrees for approximately 20 - 25 minutes or until the center comes out clean with a toothpick. Cool completely before cutting and serving (very important). They will be very "mushy" when they come out and will need to cool off. After cooling completely, they should be soft and fudgy after cooling, but still hold together well. This recipe will make approximately 8 small brownies. The photographs for "Flourless Peanut Butter Swirl Brownies" by Karielyn Tillman of The Healthy Family and Home are licensed under a Creative Commons Attribution-NonCommercial 4.0 International License and cannot be used without my written permission. I added 1 scoop of vanilla whey. It tastes great! A flax egg is usually 1 TBSP flaxseed and 3 TBSP water. But the flax egg in this recipe is 2 TBSP flaxseed to 1 TBSP water. Is that correct? Hi there Eric! I went back to the original recipe from the original author (link at the bottom of the recipe) to double check and although she indicated “1 tablespoon ground flax seeds + 2 tablespoons of water”, I too, also use “1 tablespoon ground flax seeds + 3 tablespoons of water” to make a flax egg. So I’m updating the recipe to reflect the flax egg mixture that I use. Tried these tonight and they are to die for. Mine didn’t turn out the same way though, they were very flat and gooey even after baking for 25 minutes. I ate them anyways and they’re absolutely amazing! They’re so delicious and decadent that I kept forgetting they were healthy and started to feel a little guilty about them! Will definitely be making these babies again! Hi Gracie! I’m glad you liked them even though they weren’t visually appealing lol! Sometimes when I make them, I use raw coconut crystals (granular sweetener) and because I don’t have the extra liquid from the maple syrup, mine turn out a little on the dry side, but I’ve never had them flat, and especially gooey. The only liquids are the maple syrup and flax eggs so I’m thinking it has to be one of those. If you didn’t need them to be vegan, you could replace the flax eggs with an organic pasture egg and that might make them not so flat. But I’m like you, even when mine didn’t come out perfect, they were gone by the end of the day! I seriously make these at least once a week. These sound amazing! I will be trying them soon!